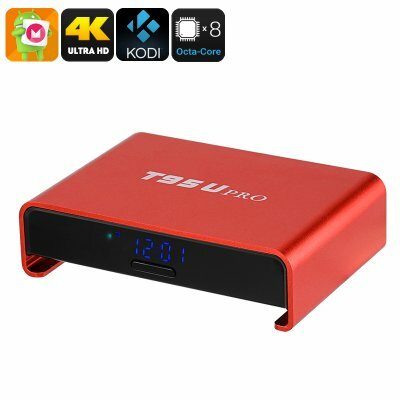 Successfully Added T95U PRO Android TV Box - Android 6.0, 4K Movie Support, Google Play, KODI TV, Octa-Core CPU, 2GB RAM to your Shopping Cart. The T95U PRO TV Box is your gateway to an online media world filled with entertainment and 4K movies that can be enjoyed conveniently from the comfort of your own living room. With its red metal design this Android TV box holds a sleek and modern look that is sure to grab the attention of your friends and visitors. Simply hook this home entertainment system up to your flat screen TV and you are ready to browse the web and enjoy hour’s worth of media and games – guaranteeing that from now on there won’t be a single moment of boredom anymore within your household. Running on an Android 6.0 operating system the T95U PRO TV box is guaranteed to deliver a smooth user experience that lets you enjoy the latest features the industry has to offer. Supporting both KODI TV and Google play this Android TV box gives you access to an unlimited pool of online entertainment. Play games, watch movies, or download the latest Apps – with the T95U PRO TV box countless hours of fun and entertainment lay ahead. With 16GB of internal memory and the possibility to add an additional 32GB externally, you can be assured that there will always be enough space to save all your media, games, and personal files. Supporting Dual-Band Wi-Fi this 4K TV box lets you enjoy the fastest data speeds out there, totally eliminating the annoyances of slow and laggy internet connections. So head out on the web and stream online movies in lightning speeds or download the latest Apps, games, and more in the blink of an eye – with its Dual-Band Wi-Fi connection you will be able to enjoy a smooth and fast internet connection without exception. The T95U PRO TV Box comes with a 12 months warranty, brought to you by the leader Android TV Boxes as well as wholesale electronic gadgets..